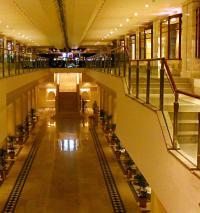 Lahore Pearl continental hotel is one of the best hotels in Lahore. 250 rooms in in their old mall wing and 200 rooms in the new Atrium wing. The hotel is equiped with all amenities of a 5 star hotel. Pearl Continental or PC Hotel as it is called by the masses is a land mark of the city situated at Mall Road. It is close to the shopping areas and all the tourist attractions of Lahore eg: Lahore Museum the Lahore for Badshahi Mosque and Anar Kali bazaar. 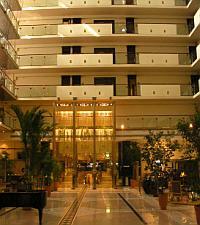 Pearl Continental is an ideal hotel for businessmen as well as leisure travellers in Lahore. Cancellation Terms and conditions:- Confirmed Rooms must be canceled 48 hours before arrival. Pearl Continental Hotel in Lahore, offers above rates only to Hunza tours. The online reservation payment must be made to Hunza tours not the hotel. Book your events, Meetings, Conferences Marriage parties at Pearl Continental Hotel or any other hotel in Lahore please feel free to email us we will offer you the best possible rates and perfect arrangements to suit your events. The Pearl Continental Lahore is a 5 Star Deluxe hotel centrally located in the heart of Lahore. The Hotel is 5 minutes drive away from the central city and 25 minutes away from Allama Iqbal International Airport. Main attraction for visitors to Lahore are Lahore Fort, Mughlai Badshahi Mosque, Mughlai Shalimar Gardens, Polo Club, Gymkhana Golf Course, Alhamra Arts Council, Lahore Museum, Quaid-e-Azam Library and Race Course Park which are within 10 km radius of the Hotel. The Hotel has 485 exclusively appointed bedrooms, which includes 193 Standard rooms, 238 Atrium Deluxe rooms and 49 Luxurious Suites providing various levels of guest comfort. All bedrooms of the hotel feature with electronic key system, safe deposit boxes, International direct dialing, Data port, Satellite TV Channels and Minibar. To ensure the guest safety and security, all bedrooms are equipped with smoke detectors and water sprinklers. For high level security of the valued guests, the hotel is equipped with closed circuit TV system and our elaborate scanning system for hotel guests/visitors and their belongings. This equipment is state-of-the-art and manned round the clock by well-trained professionals. The Pearl Continental Lahore has 485 exclusively appointed bedrooms, which includes 193 Standard rooms, 238 Atrium Deluxe rooms and 49 Luxurious Suites providing various levels of guest comfort. Pearl Continental Hotel offers you a choice of 9 restaurants for great dining experience in Lahore. Guests favourite all day dining room with new look offers Breakfast, Lunch, Dinner, Buffet selection and Ala-carte menu. Sunday family brunch is very popular among guests. A genuine Mughlai Restaurant, with an authentic selection of dishes from the sub-continent complimented with our Chefs creativity. Open for Lunch and Dinner. For exclusive dining, private dining rooms are available on request. Oriental China comes to life as you enter this restaurant, serving the most traditional Chinese cuisine in an ambiance that slows in time and takes you back to the QIN era (221 b.c.). Open for lunch, dinner and Ala-carte only. It also has choice of private dining rooms. The only authentic Thai Restaurant in town, serving you the true taste of Thailand prepared exclusively for you by our expatriate Chefs. Open seven days a week for buffet lunch and Ala-carte dinner. Three private dining rooms are also available for exclusive family or business meals. An open-air restaurant, renowned for its fine bar-be-que delicacies and ethnic atmosphere, which is a real treat for someone who wants to be introduced to the fine art of Eastern cooking. Open for buffet dinner only, seven days a week. The hotel's main relaxing area living room, commanding a fabulous view of the lobby, serving Hi-tea, Coffee and Sushi Bar throughout the day or evening in a most congenial setting. Open from l0am to 10pm. This state of the art modern restaurant gives a warm and clubby ambiance to the most favored choice of steak lovers in town. As being the first restaurant of its kind in town, we take pride in serving imported halal beef to our customers. Open for dinner only. This one-stop hip-hop restaurant offers a quick bite or ready-to-go snacks at very compatible prices. Open seven days a week from l0am till 11pm. Our special takeaway Bakery Shop offers delicious Cakes, Pastries, Savories and Pakistani sweets. Open from 9am till 11pm daily. Offering the largest banquet and conference facilities in Pakistan about 56,000 square feet, caters to almost every event that can be thought of ranging from international conventions to wedding ceremonies. We make the unimaginable; become a reality at our banquets. The Pearl Continental Hotel, Lahore is not simply all that. It has every intention of offering its guests services and facilities that they expect of a genuine Five Star hotels, services which have not yet been made available on this scale before in Pakistan. When you plan an event at Pearl Continental Hotel Lahore, count on more than simply a place to gather. Count on the ultimate in service, organization and convenience. We provide everything you could expect from a Five Star deluxe hotel including Certified Meeting Professionals to work within your budget, and a range of rate plans for groups of any size. We have over 55,000 square feet of meeting space. The Crystal Ballroom, which accommodates up to 1000 People, to our Board Room featuring seating for 20. Our in-house audio visual services and our experienced Banquet Staff support your event's success. We believe that catering is not simply a question of presenting a few sandwiches and some music. Catering is about putting on an event, staging a kind of show, regardless of whether there are 35 guests or 3,500. Taking care of the organizational side is our business. We have the experience to handle a wide variety of events, and the location puts the icing on the cake. From the creative to the festive to the unusual, we will find the right setting for your event. Our few special theme events are Mughlai, Punjabi, Jungle, Hawaiian and Mexican and it will be more than just another function. It will provide you with a vehicle for your ideas.